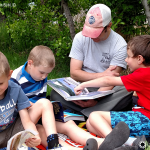 I read this article and wanted to share it with you: Being (and Staying) Content With Your Homeschool Curriculum https://blog.sonlight.com/content-homeschool-curriculum.html. This post was originally published as Being Content With Your Curriculum on Delightful Learning. It is reposted here with permission of the author, Michelle Gibson. When it comes to homeschooling, we all too often meddle with something that is already quite wonderful—our curriculum. The newness wears off. We get bored with it. We try to make it better. Or we see what other homeschoolers are using, and we want to do the same. In the process of meddling, we forget to enjoy what we have. I often take running water for granted. I take long baths and fill the kitchen sink with hot soapy water not thinking about the fact that I have running water. Then, we make a trip to our off-grid home in Montana where we don't have running water. We haul our water in 5 gallon containers, and when I take a bath, I heat the water in pots on a wood cook stove. It's a lot of work, but I revel in the moment. I have wood to burn, heat to warm the water with, and a tub to put the water in. We even have pipes to carry the water out of the house. It's quiet and peaceful, and I get to unplug from the world, hear the cricket's chirp, and see the stars shine bright in the night sky. It takes a conscious awareness to savor everyday moments. How often do we revel in the ordinary, the mundane, or even the uncomfortable? We live in a drafty, old rental house and we've been here longer than any home I've ever lived in, and I love to move - it's a time of purging and fresh starts, so I wanted desperately to move to a cozy house of my own with lots of windows, natural light, and a front door that isn't falling off its hinges. But, I took down the dark insulating curtains and put up sheer curtains to let more light in. I rearranged. I purged. I painted. I learned to be content. In the same way, we can be content with our homeschool curriculum if we purpose to be. Year after year, I heap curriculum on top of curriculum to eliminate gaps and provide my kids with the best of the best. But, I was recently challenged to stop doubling up and pick the one that does it better. 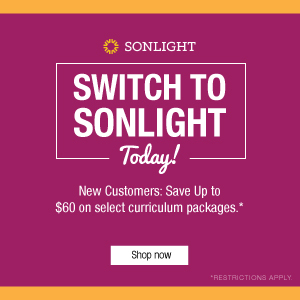 Sonlight is a good fit for our homeschool because Sonlight's main goal is to inspire a love of learning. 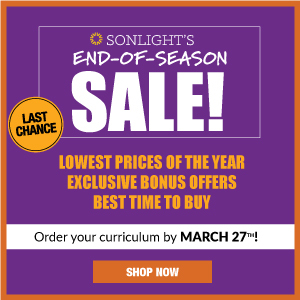 Our children can't possibly learn everything they need to know before they leave home, so Sonlight developed a Christ-centered, literature-rich curriculum that builds family bonds, cultural literacy, and academic excellence, while cultivating children’s natural curiosity and love for stories, giving them a love for learning that will prepare them to be lifelong learners. 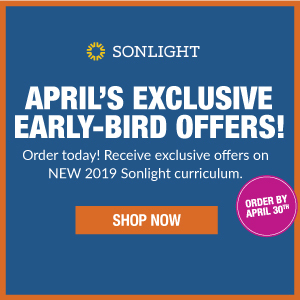 There are more reasons we love Sonlight, but today I want to share how I plan to be content with just one curriculum after years of heaping curriculum on top of curriculum. Count your blessings. Find the beauty in what you are doing. Find the moments that enrich your days and be grateful for the little things: a cup of tea, a good book, a home to live in, children to homeschool. 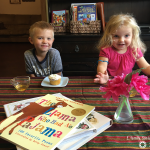 Take a good look at your homeschool and find the moments that bring joy, the subjects you take delight in teaching, and the simple pastimes that make you happy. Find the beauty and goodness in what you have. Appreciate the little things, and be grateful for what you have. Stop comparing yourself to others. We spend time carefully choosing and praying over our selections before hitting the submit button. Rest in that. The grass isn't always greener on the other side. Remember that being content is a choice. If you are bored or sick of doing the same thing, find one new thing to do each week - have a tea party, pop popcorn, bake apples, or take school outside for the day. You don't have to be good at everything. Don't take yourself so seriously, have a sense of humor, and avoid being a perfectionist. Be satisfied with who you are and what you have - right now. Do the next thing. When you make a habit of doing the next thing, you will be more intentional and feel more purposeful. If you focus on today and what needs done right now, you will accomplish more than you thought possible. Simplify your life, if needed. You'll have less to worry about, right? If you feel like you are falling behind, just open your IG and do the next thing. Don't worry about staying on schedule - just get through today. I am... a homeschool mom. I can… do all things through Christ who strengthens me. I ought… to do my duty to God and my children. I will… choose the right. You will have good days and bad. 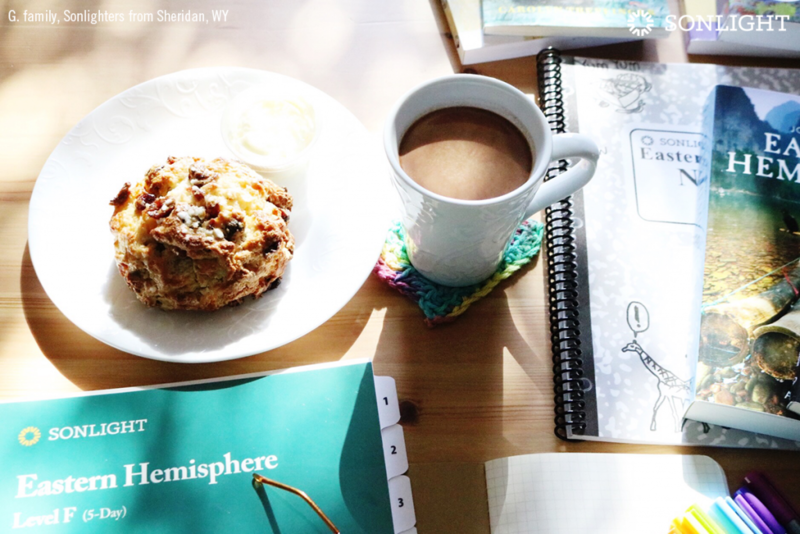 When times are tough, say to yourself, "I will... do the work of homeschooling." Practice self-discipline. Find a rhythm or routine that works for you. Develop healthy habits. Create a schedule or start a daily tracker - whatever works for you. Make changes if necessary, but think long and hard about what is standing in the way of you being content, and don't change everything - don't throw the baby out with the bath water. In other words, don't eliminate something that is working when trying to get rid of something that isn't. Ask God what He wants you to learn in your present circumstance, instead of telling Him what you want Him to change. It may take time, but you must persevere. Not too long ago, I was taking my weekly soak, and I was so thankful for the deep claw foot tub filled with hot, salty water to soak in and the cool breeze coming in through the window to cool me, that I felt so happy and content. Then, I quickly felt a check in my heart to not be too content that God can't move me from this place. It was then that I realized that I could learn to find contentment wherever He wants me to be. 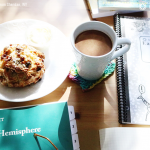 However, I am still learning to be content when it comes to homeschool curriculum. I have filled our days with unit studies, hands-on activities, and experiences on top of a full curriculum for years. But, I over-plan and burn out often. When I get overwhelmed like this, I crave a boxed curriculum all planned out for me. But, I can never let it be. I always try to make it better. This year I am ready for a break from planning, from scheduling, from over-doing. I want to be content, and I want a curriculum that I know works for us without all the work. I want to be able to close the school room door at the end of the day and not worry about tomorrow. So, in deciding which one does the job the best, I went with the company I have used since the beginning, and I am going to be content and see how God can work in our homeschool. 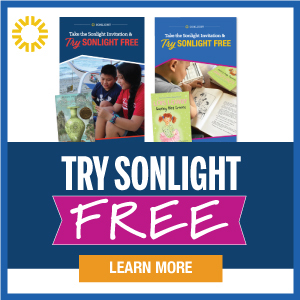 My goal is to use Sonlight as is without heaping any other curriculum on top. My rule: any projects or activities must be a suggested activity in the guide or be inspired by a book itself. "Inspired by" could mean anything from making something mentioned in a book (a craft, a project, a recipe) or adding to a suggested activity in a natural and meaningful way. My goal is to do projects or activities that have true educational value and that come naturally. 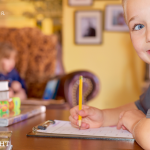 When I first began homeschooling back in 2002, I believed that God led me to Sonlight. I still have my first catalog. Not as glossy as they are now, but I cherish it. And I asked God to not let me be one of those moms who is constantly swayed by the breeze of the next best curriculum out there. Fifteen years later, my first has graduated, my second is a senior, I have three more in the ranks - and I have stayed with Sonlight all along. It has been a good thing. 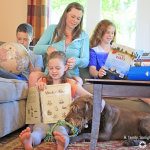 Laura, reading my first Sonlight catalog from cover to cover made me fall in love with the idea of homeschooling! Well done on staying the course! It's a good thing indeed.